Amaze Your Friends as you 3D Like a Pro! As a full time computer geek and former avionics technician, my main area of expertise is radio and electronic systems, so when the Eagle Tree Guardian 2D/3D inertial stabilizer came in for review my hand shot up like Arnold Horshack on Welcome Back Kotter. Besides, I just really love gadgets! Kit contents, sensor, wiring harness, and quick start card. The Guardian is a 3-axis (pitch/roll/yaw) gyro with the ability to hold its commanded position, return to a pre-programmed level flight orientation, or dampen the effect of wind, depending upon the mode selected. The 2D mode will smooth out unwanted oscillations caused by either pilot inexperience or windy conditions and recover if you let go of the sticks. The 3D mode will hold the model wherever you point it (within reason). As a club instructor I’ve flown a number of these types of systems over the years. Most of the time when I’m asked to fly a model with something like this installed I request that it be disabled or bypassed because every one that I had previously flown seemed to fight the controls to the point where I was uncomfortable flying the plane. The common denominator with my unpleasant experiences was that I didn’t have the chance to install, configure, and understand the system myself, so I was anxious to get started with the Eagle Tree where I had control over the entire process. Eagle Tree Systems has an excellent reputation and I have used a number of their products, such as their data loggers and variometers, over the years, so I had complete confidence in the pedigree of the product. Before I even unpacked the little stabilizer I sat down and read the 14-page manual cover to cover and installed the Eagle Tree software on my laptop to play with it. The unit can be configured by toggling the mode switch and watching the LED on the unit, but using the software makes everything a lot simpler and I highly recommend using it. The Eagle Tree 2D/3D is a three-axis inertial dampening system that provides smooth flight in gusty winds, auto leveling when the controls are released, and heading lock functionality for some fun aerobatics. I’ve always held a healthy skepticism for these “auto pilot” systems. However, the Eagle Tree Guardian 2D/3D impressed quite a few people at the field with its ability recover from any orientation and hold our test aircraft in a hover even in winds gusting to 20 mph on test day. > The Eagle Tree Guardian’s 2D mode pro vides smooth flight in almost any reasonable wind condition along with “release the sticks” auto recovery from any orientation. > The Guardian’s 3D mode allows you to learn orientations like belly-in hovering with increased confidence. > The Guardian has inputs to control both the mode (2D / 3D / OFF), and the system gain via transmitter switches or sliders. 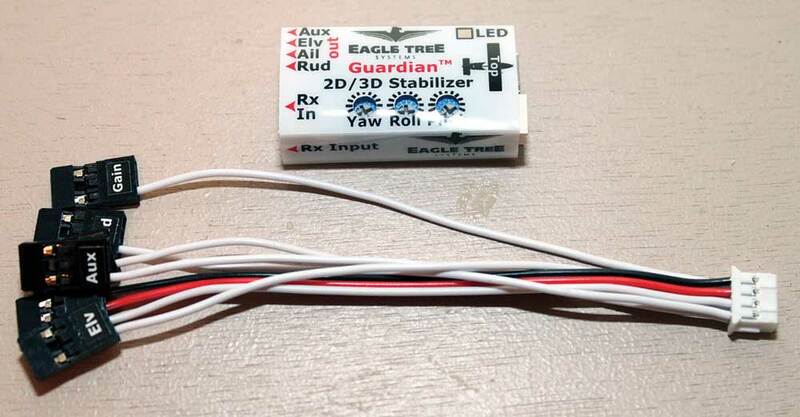 > The Eagle Tree Guardian 2D/3D is small and weighs only 11 grams so it can be installed in almost any model aircraft. > A user friendly Windows interface allows advanced features and tweaking as well as end user firmware updates when new features are released. 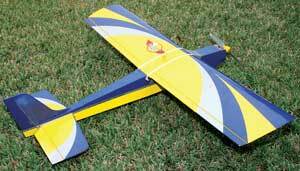 3D Hobby Shop EBT (Electric Basic Trainer) used to test the Eagle Tree Guardian. I gave some serious thought to what model I wanted to do my testing of the Eagle Tree 2D/3D stabilization system on. 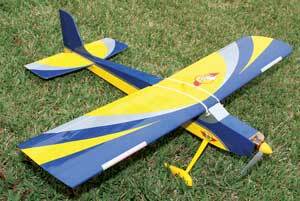 I wanted something aerobatic enough to prove the capabilities, but not expensive enough to cry if something went wrong. I settled on the 3D Hobby Shop EBT (Electric Basic Trainer) as the test bed. The EBT is a 53-inch wingspan, 3S electric-powered high wing tail dragger that is capable of trainer duty, but also performs spirited aerobatics and we even use it for towing two to three meter gliders. I chose the EBT because its wide ranging flight envelope would allow me to test the Guardian stabilizer in a variety of situations. The Guardian comes with the main sensor unit, a wiring harness, a 14-page printed instruction manual, and a laminated field card. The manual includes detailed explanations of all of the features and covers installing and using the optional software. Since I fly helicopters as well I noticed a lot of similarities to the flybarless 3-axis stabilization systems directed at that market. The wiring harness is four inches long and has a plug for the sensor and a number of servo plugs for the mandatory and optional connections to the receiver. I noticed the plugs are Spektrum/JR style and come beveled so they will fit most any receiver. Additional wiring harnesses are available from retailers and if four inches doesn’t suit your installation they have a 12-inch harness available as well. Sensor and JR921 receiver—Install the sensor on a flat spot away from vibration, preferably near the center of the aircraft. Mounting the sensor unit takes some consideration. The instructions say to mount it close to the center of the aircraft on a flat surface with the little airplane facing forward. You can mount the sensor with either double sided tape or Velcro. The best sensor mounting tape I have found for my helicopter gyro sensors is called Omicron Double Face Mounting Pad (LX5500) sold by Lynx Heli Innovations. The clear, gel-like mounting tape is 1mm thick so it provides positive mounting as well as a measure of vibration isolation. Whatever you choose to mount the sensor with, make sure it stays put in flight because if the sensor comes loose the results will be ugly. 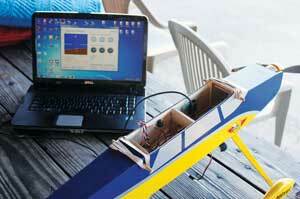 The sensor unit is small and suitable for installation on almost any fixed wing aircraft. There is a single connector for the wiring harness along with four standard servo outputs on one side and a micro USB connector on the other. Three potentiometers on the top control the direction and manual gain of the three primary control axis outputs. While the USB cable is optional, many popular phone chargers use the micro USB port so I had a cable handy. • Would be nice to have dual elevator servo support without sacrificing dual ailerons or using a “Y” harness. The wiring harness connects to the receiver and has outputs for pitch, roll, yaw, auxiliary, remote gain, and remote mode switching. The aileron is the only connector that has the power and ground wires to provide power to the sensor so it must always be plugged in. 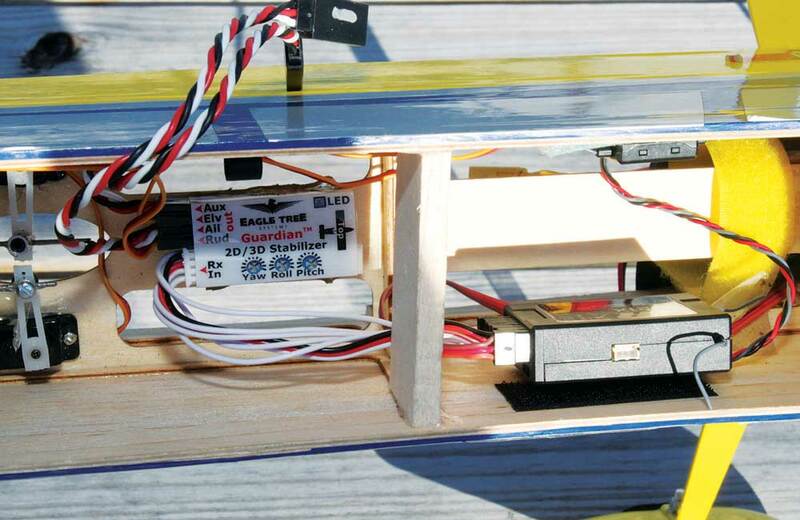 The system is capable of carrying five amps to the servos and provisions are available if more power is needed. The Aux channel is used by default for dual ailerons, but can be configured with the software to enable V-Tail or elevons. A nice feature is that these options can be used whether or not your transmitter supports advanced mixing functions. 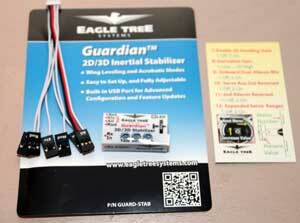 My wish list for the Guardian would be for Eagle Tree to support both dual elevator servos and dual aileron servos. This can be done with a Y-harness and mechanical tinkering or programmable servos if you’re determined to use this on a larger model. Since I was using my JR 11X and a JR921 receiver I was able to make use of a three-position switch to control the sensor mode as well as a slider to control the gain. Having the ability to turn the system off in flight made me feel a lot more comfortable test-flying the Guardian. The default assignment of the Aux channel is dual ailerons so unless you’re using the ailerons as flaps, you can leave all of your mixing turned off and the Guardian will take care of it. Guardian 2D/3D can be configured with optional software interface. Configuration can be backed up and loaded by USB interface. This is much easier than flipping switches and counting the flashing LED. I performed the pre-flight checks and leveled the model as outlined in the manual. Once all of the control surfaces were moving the right way and the corrections were working in the correct direction I decided it was time for some test flights. With the gain in the middle and the mode set to “off”, I took off and did a couple of laps and the EBT flew exactly as before. I flipped the switch to 2D mode and the EBT immediately settled down in the wind. Control inputs override the self correcting action, but I still felt I was fighting the gyro just a little bit in 2D mode. On the other hand, any orientation I could force the EBT into, the 2D mode was able to auto-recover from nearly instantly. Upside down, straight up, straight down, flat spin, release the controls and the EBT immediately flew off straight and level. In 3D mode the EBT was able to hold a rock solid hover without any input. I was actually hovering over the runway and holding the transmitter over my head with my fingers off the sticks, much to the surprise of several onlookers. The heading hold feel of 3D mode might be a little strange as the plane will go where you point it until you tell it to go somewhere else. Also, the Guardian will only do what the plane is aerodynamically capable of doing. I can hover the EBT, but it’s a handful and never as solid as when I was testing the Guardian. I ended up running about 70-percent gain, any more and I was getting some shuddering of the surfaces and with much less I was getting oscillations and a spongy feel. Screen shot from the configuration software. Allows tinkering with numerous settings as well as checking firmware version and performing online firmware updates. The artificial horizon display verifies the multi-axis gyro is functioning properly. Some people would call the Guardian2D/3D a crutch, and before owning one I might have been in that camp. My flight testing revealed that the Guardian not only works exactly as advertised, but it’s also nothing more than another tool available to modelers to enhance the enjoyment of their hobby. If the ability to flip a switch and have the plane recover makes someone a more confident pilot, I’m all for it. I know that I really enjoyed exploring this new aspect of the hobby while testing the Guardian and I look forward to finding new uses for it.